Sesame oil with a full-bodied and elegant fragrance. Can be used in making stir-fry or in flavoring other dishes. This product contains 100% sesame oil. It is made using carefully selected, high-quality sesame that has been lightly roasted over time and then pressed. The taste and scent of this top-tier sesame oil is milder and more elegant than other similar commercially available products. 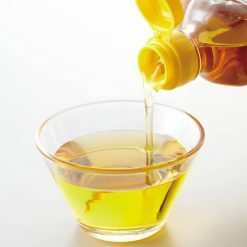 The flavors of different oils go best with different types of dishes. Because many Asian-style dishes also contain sesame in other forms, sesame oil is a great choice for use in making stir-fry, grilled meats (yakiniku), or pan-cooked noodles such as yakisoba. However, it can be delicious with a wide variety of other foods as well. Seasonings such as oils can be a crucial part of a meal, turning plain food into a delicious experience. After all, sometimes we only think we don’t like certain foods because we haven’t tried them with the right seasoning! Sugarlady’s pure sesame oil and other seasoning products are safe and free of chemical seasonings and additives, letting the true, natural flavors of the ingredients themselves shine – and allowing you to enjoy your meal without worry. 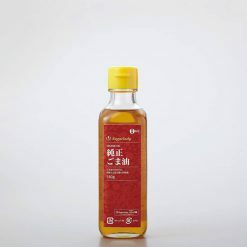 Our pure sesame oil can be used in making stir-fry, yakisoba, or in flavoring a wide range other dishes. Because sesame is quite flavorful, small quantities can be used to flavor each dish; making this product very long-lasting and easy to have on hand. This product contains sesame cooking oil (China, various regions in Africa)..